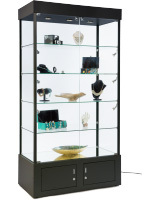 Each locking showcase, also called a free standing glass case, is loaded with all kinds of high-end features. 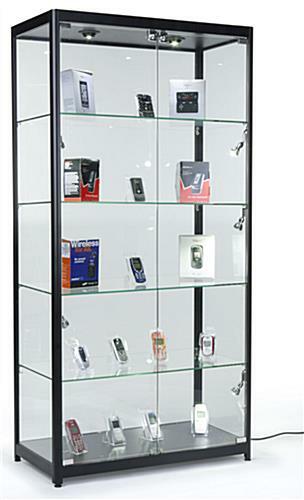 Also the glass cabinet is cheaper than most comparable store fixtures offered by the competition! 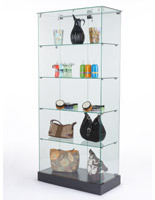 This glass locking showcase that is fully assembled requires no tools to put together. 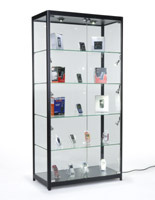 The glass display comes with (8) 20 watt halogen lights for illuminating merchandise or trophies. 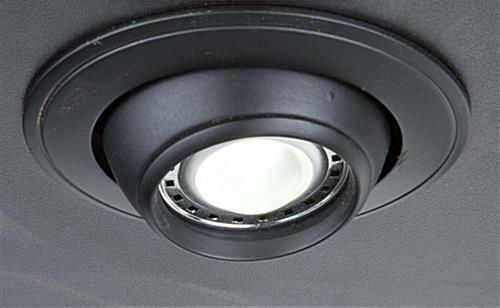 The locking showcase has (2) lights embedded in the ceiling of the display and (6) sidelights that can swivel up, down, left and right. 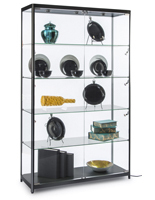 Each glass display case stands at 78" tall, making this cabinet easy to see in crowded stores. 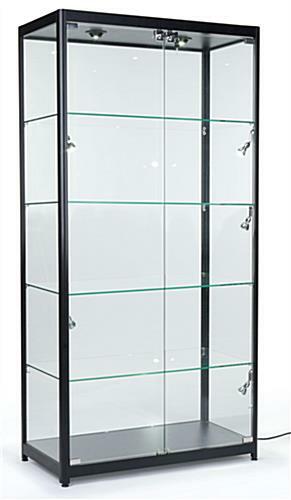 The locking showcase comes with (4) .265" thick, glass shelves. 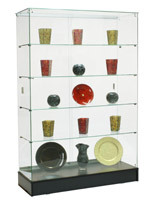 All the glass on the display case is tempered, helping prevent the glass from breaking and making the cabinet safer. 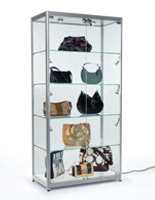 The tall locking showcase has sturdy feet to prevent the tower from tipping over or shifting. The double doors on the glass cabinet swing outwards, allowing for easy access to the interior. Each swing-open door locks separately. 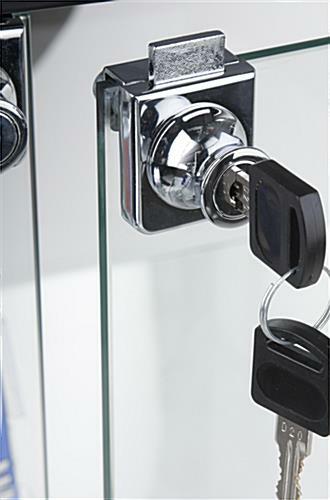 All lighting fixtures and locks on this locking showcase have a chrome finish to create an alluring contrast with the black aluminum frame. The shelves have a 38"w x 14-1/4"d surface area, which provides a significant amount of space for displaying merchandise. The semi black gloss extrusion of the frame is rounded on the corners, so there are no sharp edges. This locking showcase that is very heavy may take three people or more to remove from the shipping crate. The display case's power switch for the lights is hidden on the ceiling of the display. 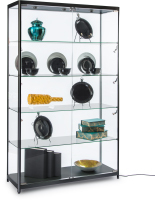 The glass tower comes with a 92" long power cord to allow for more flexibility when setting this unit up in a retail store. 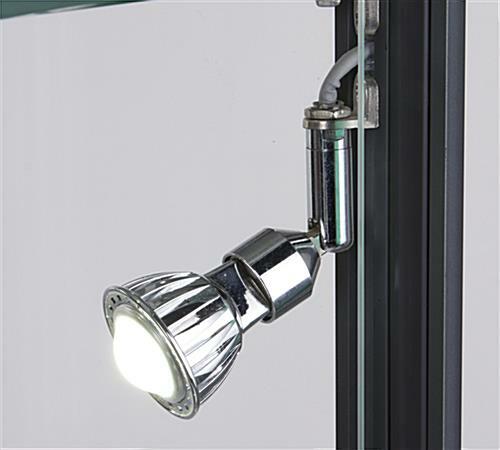 We have a previous model with sliding doors. The swing out doors are a nice update providing better access. Packaging was adequate to prevent damage. Shipping was timely although the shipper was not prepared for inside delivery. We received a shipping credit for the change. High quality display at a reasonable price. We're so happy to hear that you're pleased with your display case, Scott! Thanks so much for the great review and for the feedback on our upgrades to this model!